The Sound Transit Board approved a $10 million settlement agreement with Mercer Island after residents lost special access to Interstate 90 due to the expansion of light rail. Tacoma Mayor Marilyn Strickland, a Sound Transit board member, cast the only dissenting vote during the board’s June 22 meeting. 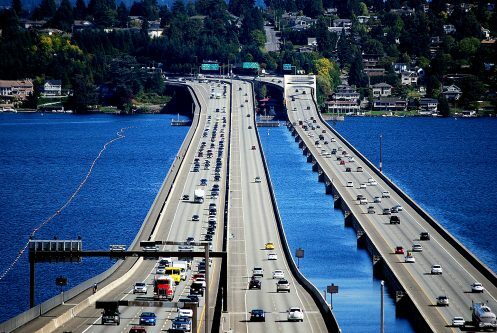 In February the Mercer Island City Council voted to sue Sound Transit and the Washington State Department of Transportation (WSDOT) after the town lost special access to I-90’s high-occupancy vehicle (HOV) lanes to make room for light rail. Mercer Island drivers would now have to abide by the HOV-2 standards. Mercer Island argued that a 1976 agreement provided them with lasting rights to HOV lanes, while WSDOT said that single-occupant vehicle (SOV) access to HOV lanes was intended to be temporary, and allowing continued SOV use of HOV lanes would violate federal law and jeopardize funding agreements. Bellevue Councilmember and Sound Transit board member Claudia Balducci defended the settlement, calling it fair, reasonable, and the board’s responsibility after conditions changed and Mercer Island was no longer able to retain the same access to I-90. An additional 100 parking stalls during the temporary closure of the South Bellevue Park-and-Ride, leased by Sound Transit, either within a third of a mile from the Mercer Island Park-and-Ride or served by transit. $4.4m from Sound Transit to build up to 200 permanent park-and-ride spaces on Mercer Island. $5.1m from Sound Transit for improvements related to traffic congestion and bike/pedestrian safety. Sound Transit-supported bus-rail intercept at 77th Avenue SE, with strict rules for non-Mercer Island buses. A last-mile pilot program launched by Sound Transit, King County Metro and Mercer Island to improve transit access. What are the “strict rules” for non-Mercer Island buses? The biggest sticking point became the loss of SOV access to the most-used onramp to Westbound I-90 with no replacement, not the loss of the center roadway. My opinion as a former Islander is most residents understood and accepted that the special access would end eventually. We even voted for it. The fact that the traffic improvements on North Mercer Way still aren’t completed demonstrates how poorly this entire situation was handled. The East Link design should have included a new ramp from Island Crest Way to the right lane of Westbound I-90, period. Leaving that out has resulted in a huge amount of unnecessary ill-will towards Sound Transit in a city with 25,000 voters. You can read hundreds of MI resident opinions from the first week of the closure below. Of course some of them are ridiculous but plenty are reasonable and some even pro-Sound Transit. Should have said 15,000 voters, 25,000 residents. We all agree that sometimes change is hard. What is difficult for many of us to accept is the fact that MI has so many on ramps west and east, even if the NB island crest on ramp becomes hov only. It’s been difficult for the region to accept the tactics of delay, uncooperation, and legal challenges by MI government to extract concessions at the last minute. It’s been difficult to accept that MI, with all of its wealth and the influence that goes along with it, to not just complain but actively participate and become part of the solution to keep the region moving. It’s been difficult to accept MI down zones and policies that keep “outsiders” (poor people) off the island. While we hear that change is hard, but MI gets no sympathy because this is a problem largely caused by MI inability to find a solution. “the fact that MI has so many on ramps west and east”???? What are you talking about? The ratio of population to ramps is unusually small, even without counting the HOV ramp. Not all ramps are equal. The East Mercer Way ramp is located such that its usage is negligible. The three town center ramps that closed carried 1,010 vehicles in the peak hour pre-closure while the one remaining town center/ICW SOV ramp carried only 180 cars and buses per hour. Most of those thousand cars an hour now drive through the Mercer Island Park & Ride on North Mercer Way with the 550s and 554s. For this reason alone, it’s unfortunate a new ICW ramp was not built. Route 550 goes away with the opening of East Link six or so years from now. Route 554 will likely be forced to serve South Bellevue Station instead of the easier-to-reach MI Station. As a result, any investment in improving traffic flow would be useful for less than five years for transit, so don’t expect Sound Transit to do more than give Mercer Island the $5 million it has already promised. It is up to Mercer Island to decide whether to spend any of it at all on bike and pedestrian safety, or blow it all on improving SOV traffic flow. This total car number seems very small. >The three town center ramps that closed carried 1,010 vehicles in the peak hour pre-closure >while the one remaining town center/ICW SOV ramp carried only 180 cars and buses per hour. This really is only 1000 people per hour. Whats East Link supposed to carry? Strange that MI isn’t doing more to limit cut through traffic. Pretty direct correlation of traffic using first off- and last on- ramps when throughput slows on I90 through Mercer Island. It doesn’t take waze to see that its faster and less stressful. Remember it was Bellevue’s wrangling that delayed East Link by two years, not Mercer Island’s. My understanding is Mercer Island Station will still be completed in 2019 and then sit for for four years while other sections of the line are completed. We can all agree 2023 can’t come soon enough. I don’t recall MI Station ever being scheduled to open in 2019. Not the rest of East Link before 2023. According to the below timeline, construction of MI station will be complete in Q2 2019. Not that it would have happened, but an interesting settlement would have been ST opening the station early in exchange for MI agreeing to the bus intercept plan and dropping its lawsuit. I-90 is not finished until 2021, and the testing takes up 3/4 of 2022, so they could park a train at Mercer Island but it wouldn’t be able to go anywhere. Then it would attract graffiti and stuff. I agree with Peter; some way to let the Island Crest Way cars “merge through” the HOV lane should have been found. If that meant sending say 10% of the Federal match for the R8A project back, so be it. That wouldn’t have been any more than $10 million and probably much less. The removal of HOV status would have been at most 3/8 of a mile, and buses will be delayed for only six years. It’s obvious from the agreement that there will not be significant bus looping on Mercer Island, and that is a shame really; it’s by far the most efficient place to intercept I-90 buses and would lessen the traffic and crowds at South Bellevue, where any I-405 buses will be intercepted. The city, WSDOT, Sound Transit and others asked the feds for what you are describing (allowing SOVs to use the Island Crest Way on ramp then merge into the GP lanes) and the feds said no. It’s not a matter of sending back R8A funding but the fact that federal law does not allow SOVs to be in HOV lanes built after 1991. Don’t preach to me. I understand that arguments and you’re not getting the subtlety of what I’m proposing. Lots of people don’t. Simply declare the 3/8 of a mile west of the point of the Island Crest Way on-ramp to be a general purpose lane. Figure out the percentage of the total lanes reserved for R8A (about six I believe) and then divide 3/8 by how ever many miles it is and then multiply that fairly small decimal value by the total Federal contribution. Send that amount back. Sorry, “figure out the distance of the total lanes…”. The $10 million for Mercer Island may be money well spent. Though I do think that the whole Sound Transit electorate, has the right and duty to compare this figure with the legal fees, paid and threatened, that helped negotiate this result. Fifty years ago, my International Relations professor told us in a list of cautions on the use of armed force: “You’ll have to live with the precedent you set.” Our country’s overseas performance ever since daily prove why Sheldon Appleton should have stayed in Government. I hope Marilyn is right about the Budget Dust. But car tab increases are probably talcum powder by comparison, but still raise serious diaper rash. So probably wise to have same amount in a “Dusty Day” fund when Pierce County says that since they can’t afford same legal services, they can’t afford to stay in Sound Transit either. Mercer Island lost a lot of future sales tax revenue by keeping down the number of buses that would terminate at Mercer Island Station. However, a future city council with cooler heads may realize what they’ve done, and the value of commerce in their downtown shopping area, and waive that requirement. Same with their resistance to TOD, even in their downtown shopping area. At 15,000 voters, they need more voters to continue having undue influence. I agree. That is the part of this settlement that doesn’t really help Mercer Island. Everything else (even the park and ride spots) seems like a big win for Mercer Island. But having fewer buses go to Mercer Island is really not good for the people who live or work there, and it wouldn’t surprise me if in the future they change their mind. It depends on what the cap is, and the impact of what ST and Metro do to comply with it. Is it a ceiling they weren’t going to hit anyway? Does it keep almost all buses from the east off the island? Whose trips does it change and how much? Without those we can’t really evaluate the cap, except to say the word “strict” sounds ominous. There was once a plan to have most of the I-90 routes terminate at MI Station, which would have been the most convenient transfer point for the vast majority of riders who use those routes. Now, Mercer Islanders are just not going to be able to find parking near the station, as it will all be filled up with people commuting to MI Station who might have been willing to take the bus there. Virtually all the on street parking anywhere near the station is either (1) short term parking, (2) resident permit required during weekdays or (3) commuter permit parking during weekdays (which is only available to MI residents). That particular problem was solved years ago. If it becomes a problem, I expect that it will be a nice earner for MI. If I were a Mercer Island downtown business owner I’d be pretty furious with my community placing irrational animus against outsiders over my own survival. It is precedent setting, but only because a city threatened to sue for more money. This sort of thing happens all the time with private businesses. It happens all the time with private land owners and government entities, including Sound Transit. If Sound Transit needs land, they will take it and calculate the value of the property. If the land owner thinks it is worth more, they can take it to court. Typically, they settle, and the land owner gets a bit more money then they would otherwise, since going to court is expensive (for Sound Transit). For this particular situation, 10 million is a reasonable settlement. Some of these things were likely to be done anyway (as some of the representatives said). My understanding (based on what others have said) is that the EIS wasn’t as good as it could have been, as it didn’t address the extra traffic in Mercer Island caused by SOV drivers not being able to use the ramp they had used in the past. This means that it could have been dragged through the courts, and ST might have been forced to write another EIS. I think ST got a good deal, overall. I think those who want to shake down ST recognize the unusual nature of this case and thus I doubt that many will see this as a reason to shake down ST.
$5.1M–half of the settlement–for “traffic congestion and bike/ped safety.” Most likely than not 90% of more of this is going towards road work for SOVs. Sound TRANSIT paying for SOV roadway stuff–now that’s setting a precedent? Is it true the 550 will go away? On an unrelared question does anyone know where the255 ranks in ridership? Yes. All of ST’s planning scenarios as of Jan 2016 have all ST2 buses truncated at Mercer Island or South Bellevue, Lynnwood, and KDM. Link was explicitly intended to replace the 550. The fate of the 545 and 554 has been less certain, but this is ST’s latest public musings on the topic. ST3 changed the baseline a little bit but not in the Eastside. The most likely ST3 effect in my opinion is that KDM is being rolled into Federal Way and postponed to 2024 instead of 2023, so I assume the south end bus restructure will wait for it and be truncated at Federal Way. Metro will have various additional Express routes not shown here, but those will be mostly crosstown and on 520 to UW and SLU, not on I-90 to downtown. I surely hope that KDM won’t be the south intercept, at least not without a separate interchange for buses only at South 240th. It will be about five minutes minimum for a northbound bus to make four left turns necessary to get to the station, three of which have traffic signals. They are the off-ramp to KDM Road, KDM to SR 99, SR 99 to South 240th and South 240th to 30th Avenue South. Now southbound would be fine, just two right turns and away we go. Federal Way already has direct access to and from the HOV lanes. A new east-west street and intersection is being built, I think where the Jiffy Lube and loop behind it is at 236th. That will go right to the station. It will still be an excessive number of turns for buses coming on KDM Road from the east, but not as bad as going to 240th and backtracking. Thanks for that info. I still think that extending 240th across the freeway on a bus-only bridge (or underpass) and adding an HOV interchange makes huge sense there. The bus crossing gets the buses out of the mess on K-DM Road between Military and PHS and avoids all those stoplights. No, it’s not cheap, but isn’t it time for some targeted investments in better bus/Link interfaces? I’m assuming the Des Moines-Kent Rapid Ride would use this too. Remember that, as Mike points out, the south intercept will almost certainly now be Federal Way. The Kent RapidRide will suffer with all these turns. There’s essentially no way Link+RapidRide can be as fast as the 150 to Kent. Link+180 has the same daytime travel time as the 150 but then you have to add the transfer. Link + KDM RR will probably be about the same. That’s sad for Kent that it’s missing out again. Also, Link + KDM RR doesn’t go to north Kent were some workers’ destinations actually are. Sigh, does Metro have anything more planned? A Seattle – Renton – Kent – Auburn express, although it’s unclear whether it would stop in Renton or Tukwila. $4.4m from Sound Transit to build up to 200 permanent park-and-ride spaces on Mercer Island FOR EXCLUSIVE USE BY MERCER ISLAND RESIDENTS. There. Fixed it for you. I think this was a mistake and a costly waste by sound transit. How many people in our region does it take to provide $10 million in regional to Mercer island? The parking garage at Tacoma Dome Station gets full by 0700 – 0800. Maybe Tacoma residents should get exclusive use of the parking garage? Let’s sue over that — speaking of precedent. To the STB staff and free-lancers: A big “Thank You” for your consistent and credited use of my photography. Much appreciated! Read this article waiting in line to enter the NAS Whidbey Open House this morning. #1. Just want to let Seattle Transit Blog’s new reporter know your article and what you decided to focus on is why I give Seattle Transit Blog $15/month. I hope others will continue or join me in giving Seattle Transit Blog that financial support. #2. I too am not happy at the precedent set. It’s going to embolden other local municipalities to try to either undo ST3 or make fiscally irresponsible demands. Now the below are hypotheticals but hypothetical questions that I think Mayor Strickland rightfully foresaw, like what if Everett demanded the light rail detour to serve the relatively small two-gate Paine Field Commercial Terminal within say 1,000 feet? Or what if Issaquah wants more parking? Or if Pierce County Government being it couldn’t exit ST3 demands the cheapest or fastest alternatives possible? Yeah, this is the kind of precedent setting that is going to tie the hands of those implementing ST3. The protestations of one of Mercer Island’s citizen advocates aside, it’s well known Mercer Island folks are well-off and that will be brought up as well down the line… again, limiting the ability of current & future board members to keep ST3 on track. Mayor Strickland is 100% right. Ny letting the rich whiners of Mercer island shake down Sound Transit we just opened the door for ever suburb to do the same friggin thing. The best evidencevof this is the mayor of Mountlake Terrace is already demanding more money for his constituents for a parkong garage and refusing to approve permits until he gets something. Its incredibly unfair to people who voted to build transit as quickly and efficiently as possible, and its also unfair to stations already approved and being built who had to come up with their own money for pedestrian bridges. They will regret the feelIng of entitlement and resentment they just created with this one bad decision. $10M: peanuts to all of the yuppies in Bellevue, Seattle, Mercer Island, Kirkland, Medina, and Redmond, where home prices for modest single family homes approaches $1M on a regular basis. For your taxpayers in Pierce County, where a modest home with land can be bought for under $200k, this is absurd. Thank you, Marilyn Strickland! Thank you, Lizz & STB for reporting!!! How about instead of $10 million blank check provide Mercer Island community $10 million worth of transit capital improvements transit fares.